About 4,000 armoured vehicles 1939-2016. Iran is the siege of one of the most ancient and brilliant civilizations in the whole continent. Persia was perhaps the world first global superpower of its time, an empire made of a king of kings and the rulers from many cultures and locations, stretching from Africa to India, with only Greece standing in its way in the West. Persia did not stop completely after the Greek conquest, as former Satrapies were still included in the new Seleucid Empire after the death of Alexander the Great. Parthia eventually ruled the region, drawing a new empire and claiming itself to be the successor, both culturally and politically of the ancient “Pars”. Parthia was eventually crushed and conquered by the fearsome Sassanids in the Christian eras, and themselves were later expelled and “Persia” converted to Islam. It was later known as a center of Shi’ite Islam. The country was still named as such in the XIXth century. The most renown professional core of the multicultural army was founded in 580 BC by Cyrus the Great. The “Immortals” were named after their composition that never changed, possibly by using massive amounts of reserves when engaged. This tradition was passed through the Persians to the Sassanids. In medieval times, the Safavid Dynasty created the Qezelbash, modeled (especially in the XVIIth and XVIIIth centuries) much after European influence and eventually led by European officers. In 1914, the Qajar armed forces consisted in four foreign-commanded armies reinforced by provincial and tribal forces in case of war. However, the loyalty of these disparate forces was dubious towards Tehran, which relied on an 8,000-strong Persian Cossack Brigade created initially in 1878, which passed after the October revolution in Russia to Persian commanders. A previously Swedish 8,400-man Gendarmerie became after 1911 the first internal security force. The South Persia Rifles was commanded by British officers from 1916 was added to the mix, and the Qajar palace guard, the Nizam, was 2,000 men strong, headed by a Swedish Officer. With these quite disparate forces, Persia reluctantly entered ww1. What is known as the Persian Campaign was for the duration of the war a struggle between, on one side, the British and Russian Empires, plus their Armenian and Assyrian allies against the Ottoman Empire, on the Iranian territory. Instrumental in this, on the British side, was the Anglo-Persian Oil Company, contracted to supply the navy in 1914, whereas Russian motives were more territorial. In this, the Ottoman Empire, and its forces led by Enver Pasha played an ambitious pan-Turanian project. The Persian forces (neutral then) levied district battalions, each under its own chiefs. Each one had about 4-8 cannons and numbered about 600-800 men. There were also tribal militias numbering 50,000, with many horsemen. Some were well-trained and efficient due to a strong cultural identity: The Qashqai in particular, but also the Tangistani, Laristani and Khamseh tribesmen. Persia was then independent of the Ottoman Empire, but at least a gifted German agent, Wilhelm Wassmuss, (the German Lawrence) tried to lead a tribe revolt against the British. Most engagements took place in the Persian Azerbaijan. The Russian led by General Nikolai Baratov pushed into the Caucasus in 1915-16 and through northern Persia while the British to the south led by Sir Sykes and the South Persia Rifles tried to limit the German influence in southern Persia. At the end of the war (which saw only armored cars in action) the armistice of Mudros was signed (October 1918) by the Ottoman Empire and the British gained drilling rights in the regions and tried to create a protectorate in Iran. Indeed in 1919, a large force of the Soviet Socialist Republic in Rasht marched on Tehran with a composite force but eventually withdrawn in 1921. The situation was still troubled when in 1925 an officer in the Persian Cossacks, Reza Khan made a coup and eventually proclaimed the empire as the Shah of the new Pahlavi dynasty. First to recognize the feeble nature of the Persian “armies” before ww1, Reza Palhavi tried to secure an agreement with Great Britain to provide “ammunition, supplies and pay” for the new army and at the same time create a buffer against future Soviet penetrations in northern Iran. The army grew steadily and was improved in all directions: Instruction of future officers, equipment, and training. Part of the novelties for the Iranian army was tanks: The first were CKD-Skoda AH-IV tankettes. Iran was the first customer for these little tanks which equipped organically the 1st infantry division in 1941 (50 tanks delivered in 1937-38). Orders for 400 more were cut short before any delivery by the seizure of Czechoslovakia by the Germans. In addition 60 bigger CKD-Skoda TNH were also provided at the same period, and again, superior orders were never fulfilled. Would they have been honored, the Iranian Army could have fielded more than 500 tanks in 1941, a force to be reckoned with. Less is known about the armoured car though. By 1941 total forces amounted to 125,000 men, committed against internal security threat, but that could have been able to repel a Soviet attack. However, in 1941 on 25 August, the attack was double, from the North by the Soviets (44th, 47th and 53rd Armies of the Transcaucasian Front, D. Kozlov) and from the South-West by the British (8th and 10th Indian Infantry Divisions, E.Quinan). Official motives were related to alleged large German population living there, and for Moskow to open a new supply line through Iran. Although neutral, Reza Shah made no secrecy of his sympathies to Germany and had to fight the invasion. The 9 divisions were mobilized but rapidly brushed aside. In terms of tanks, only the Soviets had a 10/1 superiority, and numbers much exceeded this figure for aviation. The Iranian army also suffered by massive desertions from conscripts. Popular support for the army was only strong in the capital, whereas it was seen as an instrument of oppression elsewhere. In 1942, the Shah distanced himself from the Europeans and contacted the USA for training and support. This collaboration would endure for the rest of his (and successor’s reign) until 1979. The first crisis also called Iran-Azerbaijan Crisis was provoked in 1946 by the refusal of USSR to evacuate occupied Iranian territory, seized in agreement with the British Army in 1941 to avoid the Axis to take over the rich petroleum installations in the north. Instead, the latter fuelled a local pro-Soviet separatist People’s Republic of Azerbaijan whereas in late 1945 already, Kurdish separatists created the short-lived Republic of Mahabad. Operations against the Iranian Army dragged from April 1946 to June, and on 9 June 1947, the Peshmerga inflicted heavy casualties to the Iranians, which lost several tanks in the process. Only US pressure over the Soviet Union ended the conflict with the withdrawal of Soviet Forces and dissolution of both the Mahabad Republic and the pro-Soviet separatists fled to Azerbaijan SSR. The other major event in the east cold war was the overthrow of the new Iranian Government led by headed by Mohammed Mossadegh which promises wide-scale nationalist reforms less favorable to British and US Interests. A successful coup was orchestrated in large part due to CIA money, materials and strategy, apparently with the support of MI6 and the Foreign Office Team. The casus belli to establish the Shah back to power in a deeply religious society was the hatred for the communist and fabricated mass demonstration in the streets of Tehran of a local communist party. The Iranian Army then largely equipped with guns, trucks and cars from the US military had the opportunity to restore order and ceased the threat by “popular” backing. However, the Shah’s new grip on power will gradually degenerate into an unmitigated, fierce dictatorial regime marked by repression and torture, which ended with the 1979 revolution. For long, presidents Eisenhower, Kennedy, and Johnson pressed the Shah repeatedly to enact reforms, but in 1969 with the Nixon administration, and the strain of the Vietnam War, a change of policy favored substitution of US presence by support of local, regional powers, and Iran was in the first line facing the southern USSR border. Therefore until 1979, the Shah’s Armies were given access for free to sophisticated American weaponry, like the F14 Tomcat of the US Navy or, for our concerns, the M60A1, and also from the UK’s Mihr Main Battle Tank, in capabilities very much a transitional Chieftain/Challenger. Iranian Forces from 1972 to 1976 were sent to Oman (Dhofar Rebellion), while in 1976 a contingent intervened in Pakistan against Baloch insurgents and some personnel was also present in the Vietnam War. Under the UN banner, Iranian forces replaced Peruvian peacekeepers in Golan Heights, and later an Interim Force in Lebanon until late 1978. Meanwhile, all these acquisitions were not asserted with any more pressures for reforms. This was probably the driving force to the path of revolution in Iran. A fierce critic of the main opponent of the regime and revered religious figure in exile in France, Ayatollah Khomeini, made a triumphant return to Iran in early 1979. This triggered the revolution, which started mid-1978 and lasted until the establishment of a theocratic state. Obviously, this was accompanied by a total rejection of US support (as illustrated by the Tehran Embassy affair), but not necessarily by a Soviet takeover. Indeed USSR just invaded Afghanistan in December 1979 and never tried to venture into a deeply suspicious Iran. This was, on a contrary the emergence of a new kind of Moslem fundamentalism with a “not west or east” posture. Soon it was followed by a series of purges that expelled from the core of the army all Western trained senior commanders. This went as far as Gholam Ali Oveissi (Shah’s loyal latest general) was assassinated in Paris in 1984. The 21st Infantry Division was formed from the two dissolved ex-Imperial Guard divisions. These purges had negative effects on the Army when facing a better trained Iraqi Army in 1980. Deprived of all American Support, the brand new Army, backed by the Revolution’s guards could capitalize on a wide range of American M47 and M60A1 tanks. These were integrated into the new Ground Forces called NEZAJA (acronym). It is now 350,000 personnel (220,000 conscripts and 130,000 professionals) strong. The strong arm of the divisions counted recently 100 Chieftain Mk 3/Mk 5 MBTs (Mihr/Mobarez), 150 M-60A1s, and 150 M-47/M-48s. According to various sources, this was what remains of a park of around 400 M47 tanks, 180 M48A5 (delivered post-1970), and more crucially around 200 M60A1 (150 left after the Iran-Iraq war). These were all locally modernized, using new local names, but some of these seem to never pass the prototype stage, like the Sabalan. In addition to these US Tanks, Iran also featured 80 FV101 Scorpion and received 707 Chieftain Mk-3P, Mk-5P, about 125 to 189 FV4030/2, 41 ARV and 14 AVLB versions before the 1979 revolution. Most have been lost in combat in the following war, only about 100 Chieftains are listed today. Also, 30 M-107 and 30 M-110 self-propelled howitzer has been listed and possibly some M-109, knowing many are listed today locally as the Hoveyzeh. Crucially, with the advent of the Iran-Iraq war, the West and East seemed to take sides, and while Saddam’s regime was backed by Westerners (but received equipment from USSR and China also), traditional Iranian defiance towards USSR declined but still made China, now antagonized towards USSR a natural provider. 480 T-72S, 75 T-62s, and 540 T-54/T-55/Type 59s were obtained. In addition, North Korea, but also Brazil became short-term military providers. These were accompanied with technological transfers, laying the foundations for future local armament industries. The roots of the war took place when Sunnite’s Iraq under Saddam broke diplomatic relations with Iran, claiming the disputed border area of Abu Musa, Greater and Lesser Tunbs in the Persian Gulf. From March 1974 to March 1975, border wars over Iran’s support of Iraqi Kurds erupted. The Iraqis launched an armored offensive into Iran which was soundly defeated, largely backed by an efficient air support. Iraqi backed separatist activity in Khuzestan and Balochistan also became a growing source of tensions. After the Algiers Agreement, Iraq had to give back the Shatt al-Arab waterway and other concessions. This also meant no support (from the US and Iran) to the Peshmerga that were crushed by Iraq. Although there was some warming of the relations between the two countries, all went by the windows when the Revolution erupted in 1979, the new regime being interpreted as an emerging Pan-Islamic force, as opposed to Iraqi’s Arab nationalism, compounded by religious antagonism. One of the major tensions that led to war was the still vivid personal goal of Saddam Hussein to seize back the strategic Shatt al-Arab area. Ayatollah Ruhollah Khomeini calling on Iraqis to overthrow the Ba’ath government also fuelled resentment in Baghdad, and later Saddam’s call for an Iraqi-Iranian friendship was coldly rejected. Also Saddam’s personal ambition to became a local power and replace Egypt as a the regional Arab leader, plus the stockpiling 200,000 soldiers, 2,000 tanks and 450 aircraft whereas the Shah’s Iranian Army was collapsing were tempting basis for an invasion, that happened after a series of internal events: Anti-Ba’ath riots (believed to be Iranian supported) led to the seizure of 70,000 Iranian origin civilian’s property plus the Ambassador expelled, relations maintained only by a charge d’affaires. Later Iraq also supported riots among Iranian Arabs in Khuzestan. Meanwhile, the high-morale Iraqi Army could mobilize 12 Mechanized divisions and muster all the equipment to form the Shatt al-Arab, which local forces were believed to be under-strength. Prior to the invasion, however, a surprise air strike against the Iranian air force’s infrastructure was to be launch in order to secure aerial supremacy. A massive tank invasion on the mountainous border between Iran and Iraq was impracticable. Meanwhile, in the Iranian Army, the situation was dire, with massive officers purges, desertion rate approaching 60% and a lack of spare part and maintenance for the US origin equipment. The base of the future army was soon created as the Revolutionary Guards unit, called Sepah-e-Pasdaran. But this paramilitary organization was soon forced to act as a regular army. The attack started on 22 September 1980, the Iranian Air Forced being only slightly damaged. Nevertheless, a massive ground invasion took place the following day along 644 km (400 mi) in three simultaneous blitzkrieg-like attacks. 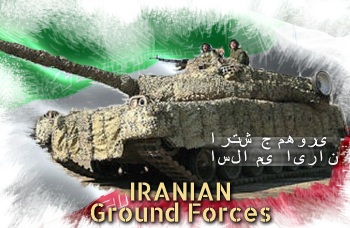 Soon the two armored divisions secured the territory within Khorramshahr, Ahvaz, Susangerd and Musian. Meanwhile, the Iranian air force massively retaliated on many strategic objectives in Iraq. In addition, AH-1 Cobra helicopters began grinding the ground forces. But on the ground, various Iranian units were not coordinated and resistance soon faded away. Apar from the Battle of Khorramshahr, where the city was lost and retaken, 1981 ended as a draw, with fixed positions and artillery duels. Meanwhile the Iranian Army received 200,000 fresh recruits available for future operations. One of the largest took place at the occasion of Operation Nasr (Victory), an Iranian counter-offensive, led by the tank brigades from the 16th Qazvin, 77th Khorasan, and 92nd Khuzestan armoured divisions. Their quick and bold offensive however left the flanks open to Iraqi tanks, that cut off the advance, and the result was a general melee called Battle of Dezful. The Iraqis lost 45 T-55 and T-62 tanks, the Iranians 100 to 200 Chieftain and M-60 tanks, many bog down in the marshes and deserted. As a consquence the general staff lost confidence in conventional tactics, preferring to put more emphasis on the Revolutionary Guard’s unconventional tactics, notably the “human wave attacks” which had been in reality coordinated groups of 22 man infantry squads reaching their objectives on the same front, sometimes using infiltration and surprise with success. Another tank battle took place with Operation Eighth Imam in late 1981 to relieve the besieged city of Abadan. A combined force of army artillery, small groups of armor supported by Pasdaran and Basij infantry lifted the siege, but a back convoy was ambushed and totally destroyed by Iraqi tanks. As the resulting tank battle Iran lost 20 Chieftains and was forced to retire from the area. The following Operation Tariq al-Qods in November was largely and infantry affair. In March 1982, Iraq’s al-Fawz al-‘Azim combined operation which mobilized its armoured brigades failed to make any impression on the Roghabiyeh pass Iranian Army, well entrenched. Furthermore, the Iraqi will lost many tanks in the following Operation Undeniable Victory, an Iranian success mainly because an efficient air force support. The 9th and 10th Armoured and 1st Mechanised divisions were surrounded and comprehensively destroyed. Iraqi T-62 captured, on display at Bovington. Operation Beit ol-Moqaddas was preceded by Iranian air raids to settle air control, support and intelligence. 70,000 Revolutionary Guard and Basij infantry attacked, backed with tanks and helicopters, driving out all Iraqi forces from the Susangerd area and Khorramshahr was besieged and taken after a long and bloody battle. Nevertheless the Iraqis then still held 3,000 tanks, while Iran could only count on 1,000. But Saddam decided to withdrew and redeploy his forces along the border with Iran. On the international scene Iran however by 1982 antagonized Saudi Arabia, which began to fund the Iraqi Army, the Gulf States being now fearful of Persian fundamentalism and influence over the region. Western powers, also weary of this destabilization in this oil-rich region decided also to back Iraq with more military supplies. As stated by President Ronald Reagan the United States “could not afford to allow Iraq to lose the war to Iran”. Even the USSR angered by the dissolution of the Tudeh Party (Iran’s national communist party), also supplied tanks and hardware to Iraq at discount price. For the press, Iran was now portrayed as the aggressor. Meanwhile Iran had captured large quantities of Iraqi tanks, enough for several tank battalions, and procured itself large quantities of supplies via clandestine networks. Saddam’s Ceasefire proposal was rejected, and operations resumed for the next six years of war, this time with Iraq taking a largely defensive stance, while its army doubled, now in 1984 with a 23 divisions and nine brigades strength. The Iraqi resupplied largely with T-55, T-62 and T-72 tanks had them often dug and protected in in-depth positions inspired by the Soviet-type three-line defence, complete with booby traps, barb wire, blockhaus and minefields. Tanks and mechanised infantry were also used for counter attacks and reduce Iranian pockets, sometimes softening Iranian troops with chemical weapons. Operation Ramadan (First Battle of Basra) was launched in the aim of taking no less than Baghdad. It was led by 100,000 Revolutionary Guards and Basij volunteers backed by tanks, including many captured T-55s. They were moaned down however by Gazelle helicopters armed with HOT missiles in “hunter-killer” teams formed by East-German advisors. The attack failed and the Iranians avoided total annihilation thanks to a last-ditch counterattack supported by AH-1 Cobra helicopters. Three more attacks on the Khorramshar-Baghdad road area led to the same result, for the loss of 400 tanks and armored vehicles destroyed or abandoned. Later on limited attacks took place with more success like Operation Muslim ibn Aqil (1–7 October). Operation Muharram saw the destruction of about 105 Iraqi tanks and 70 APCs. However Mandali, which defenses has been reinforced by T-72 MBTs failed to be captured. In 1983-84 the war turned to attrition on both sides. The Iraqi began to take back air superiority towards the end of the war. Operation Fajr al-Nasr (Before Dawn) launched 6 February 1983 saw the use on the central and northern sectors of 200,000 “last reserve” Revolutionary Guard troops on a difficult terrain, backed with few AFVs. In April, these forced has been repulsed by Iraqi mechanized and infantry divisions. Then followed a serie of six new operations (Dawn) which lasted until 1984. They achieved little success but drained infantry whereas Iraq expanded its military draft and reached one million in 1988 and they kept a tank advantage of about 1/5 which left the impression of the Iranian offensives being poorly supported by tanks and although well versed in advanced infantry tactics, commanders began to change their methods. They used more complex and more extensive maneuver warfare with light infantry and small groups attacks. Also were started commandos in amphibious warfare using speedboats in the marshes and rivers in southern Iraq. A grinding war of attrition which long term objective was to drive Iraq into economic failure. It was followed by a strategic bombing campaign against Iranian shipping, and the the so-called “Tanker War” against Kharg Island, driving the Iranians to close the Strait of Hormuz. From then on these were largely air and naval affairs, and later Iraq began to attack cities on the border and strategic objectives in the interior using missiles. Strategic situation in 1984 was dire for Iran which lost twice as many troops as Iraq. In 6 January 1985, the resupplied Iraqis launched an offensive on Majnoon Island, which soon bog down facing stiff resistance. On 28 January 1985, this was the Iranian-led Operation Badr, that was a successful, partly amphibious assault across the marshes, allowing to take many Iraqi positions, crossing the Tigris River and securing Baghdad–Basra Highway. Then the Iraqi retaliated with air attacks, gas attack and then a combined pincer movement which drove them out. For the rest of 1986 and 1987, the Iranian focused on an antidote for these gas, turned the Revolutionary Guard into a more conventional army, developed the Mohajer 1 drone and expanded air forces capabilities. The Iranian concentrated their efforts both on northern and southern Iraq (series of Operation Kerbala), multiplying human waves, still with limited armoured support. On 9, Feb. 1987 Iraqis began a massive counter-attack supported by a modernized air force, but lost many tanks to Iranian HOT missiles and TOW missile-equipped anti-tank commandos around Basra, which saw its sixth battle. At Karbala, the Iranian unleashed most of their tanks, Basij infantry and Revolutionary Guard’s 31st Ashura and the Army’s 77th Khorasan armored divisions, which was repelled after taking massive casualties. Iranian Howitzer firing. Both sides used a war of attrition where barb wire, defences in depth and gas attacks became the norm, reminding ww1. The conflict has claimed up to 900,000 KIA or more, for both sides according to some sources, the largest conventional conflict so far, more than the Vietnam War when excluding civilians. At that point, although Iran was now largely self-sufficient with its armament, the public became increasingly war-weary. Two years earlier, anti-war demonstration erupted, and draft-dodging became more usual, authorities going as far as capturing those who tried to evade conscription. By the fall of 1987 Iraq could used 5,550 tanks, more than five time Iran’s supplies, but still lacked in air power. Iran tried to support Peshmerga in Northern Iraq, and while Resolution 598 calling for an end to the hostilities was passed, a new kind of air and tanker war began, until the end of 1987, with some involvement of the US Navy. After the Iran Air Flight 655, the situation became even more tense in 1988, and several operations followed, while the Iraqi prepared for a massive offensive, called Tawakalna ala Allah Operations. In May 1988, part of these involved hundreds of tanks with massed conventional and chemical artillery barrages, securing Majnoon Island. They claimed also the capture of some 1300 armored vehicles, but in fact 570 of the 1,000 remaining Iranian tanks. This was the final blow for Iran that was left with 200 remaining operable tanks on the southern front, accepting the ceasefire. The war concluded with an Iraqi-backed Mujahadeen-e-Khalq (MEK) force that launched an attack aimed at Teheran, to achieve total victory, which was repelled by Operation Mersad, the Iranian counter-attack involving Iranian paratroopers and helicopters. By 3 September 1988, the anti-Kurd campaign also ended. -Seven infantry division, one special forces division (four brigades), one airborne brigade and one air support command. Following the traumatic experience of this eight years long war, a new staff made of seasoned commanders emerged, that pursued a dramatic restructuring. Between 1992 and 1995 an additional HQ was created and between 1997 to 1999, four corps were registered according to most sources. Samsam (Sword): Based on the M60A1 tank, with reactive armor (Kontakt-5? ), EFCS-3 Fire Control system, Laser warning system and IR jammers. Sabalan: Based on the M47 Patton (probably experimental), fitted with rigid side skirts, newly built turret and 105mm gun, laser range finder, new fire control system and communication equipment. Tosan IFV (1995) About 20 of these reverse-engineered FV101 Scorpion, upgraded are also in service for reconnaissance units. Mobarez (2006) About 50 MBTs, upgraded 2006 variants of the late Chieftain by the Shahid Kolahduz Industrial Complex. It is possible that the remainder of the Chieftains are currently upgraded to this standard. Safir-74: Local denomination for upgraded T-54/55/Type 59s. Boragh (1997) About 200 has been produced in all versions, based on the Chinese Type 86 (itself a late copy of the BMP-1). Hoveyzeh Locally manufactured M-109, about 180 in service today, as well as an unknown number of derivated Raad-2. Raad 1 Locally manufactured copy of the 2S1 Gvozdika acquired in 1996. Raad-2 Locally built mix between the M-109 turret and Boragh APC chassis. The Zulfiqar is largely based on M60A1 technology mixed with elements of the T-72. About 250 are estimated in service today of all variants, affected to elite units. These fought in the British-Soviet combined invasion of 1941. CKD AH-IV tankette 50 equipped the 1st infantry division in 1941. 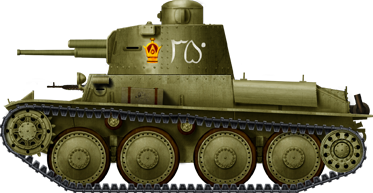 CKD-TNH 60 of these equipped the 2nd infantry division in 1941 and the Imperial Guards. Zulfiqar Standard elite main battle tank. So far, three versions are known, for perhaps 100 tanks known overall, but these figures can evolve. The Mark II/III are a well-upgraded version that recalls the Abrams. T-72S 400 built under licence in the 1990s. Now partly modernized as the Zafir-74. Zafir-74 Also called T-72Z, this is a locally upgraded variant of the T-54 by the Defense Industries Organization of Iran. Protection comprises augmented armour plus ERA blocks. The gun is the M60 Patton M68 105 mm, coupled with a modern Slovenian Fotona FCS and the engine is Ukrainian. Mihr/Mobarez MBT One of the best MBTs on offer in 1978 was the Chieftain tank imported -on Iranian specifications- from Iran. Samsan MBT Iran received M60A1 Pattons from the US in the 1970s, prior to the revolution. Sabalan MBT Based on the numerous M47 Patton still in storage but completely modernized. T-62 65 and 100 ex-Libyan a ex-Syrians imported in 1981, plus 150 more Ch’ŏnma-ho 1st generation (North Korean version) in 1982. All retired but a few nowadays. 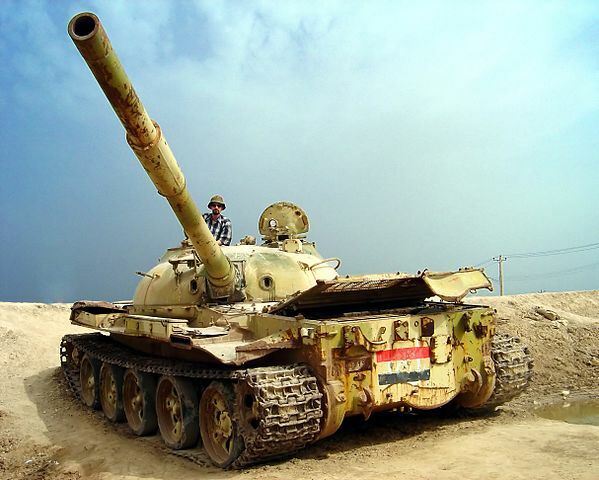 About 120 and 65 ex-Libyan and Syrian T-55s were imported, modernized since. Type 69 About 200 had been purchased directly from China or through North Korea. Decked with flags to not be confounded with their Iraqi adversaries. Type 72Z Upgraded variant on the same lines as the Zafir-74 based on the Type 69.